Introduced as a one-off in 2009 as "7th Anniversary Ale". 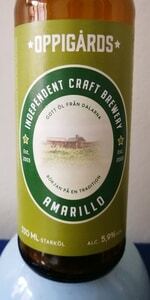 Re-launched as "Amarillo Sping" in March 2010. The name was then changed to "Amarillo" in July 2010. Poured whole bottle in a tulip glass. A: Dark amber, slightly hazy. Coarse, white foam. S: Intense, pleasant hop aroma: Sweet citrus and tangerine. Also slightly estery. T: Immediately bitter, with slighlty harsh bitterness returning a little later - slightly lingering. Mild and sweet malt taste. No real hop taste. M: Medium body, well carbonated. Crispy. Dry finish. O: Lacking hop taste. Also, I find the bitterness slightly too unbalanced in view of the malt-body for an APA. Apart from that, nice. Would probably have a second one in the pub. Bottle from rlgk, thank you! Sunny yellow color with a decent head. Floral aroma, grassy, with fruity orange. Flavor is defined by orange and citrus peel, with a decent maltiness, which evokes no signs of being sweet, but adds an enjoyable, underlyling complexity. Actually not too bitter either, but bitterness is recognizable, still, not as present as the fruit aromas. Fruits stay on the palate for a longer while, especially orange, along with an enjoyable, subtle bitterness. Easy drinkable but not boring at all, overall impression of the beer is very convincing, it is very balanced and still got a convincing character.